My MJ has been running well on my TC HP5710 512MB(F) and 256MB(R). From time to time, MJ application used to stop for not having enough RAM. Today I upgraded 256MB(R) with 512MB(R) and tried to run MJ with dongle plugged. The softphone comes up but not completely. It stops at a point with message on left panel > ATTENTION: Please wait for important upgrade within 60 seconds and in the middle panel Please connect to Internet and double click. It waits there for hours without proceeding to display " Ready To Call". I have internet on TC. Is this due to any problem in my TC or does it have anything to do with the recent software upgrade of MJ a couple of days ago which affected many ATA'a. Do anyone experience any such problem running MJ on TC? Any ideas? I am stuck here. Please help me. Its the recent upgrade. Mine was doing that also....until I pulled a stupid trick and formatted the MJ by mistake. Now it doesnt work at all. When the tecs at MJ try to get my MJ reloaded they keep telling me to do things that cut them off and when I get back its a different tech so I have to start over again. After 6 tries today I gave up. I will try again tomorrow if I feel like it. The problem is that my formatting somehow destroyed the "Removable disk" e: and when I try to do the upgrade I get an "Error broken storage". The techs tried to tell me how to reformat it but the properties are "zero used, zero available" so windows doesnt know what to format!! If you are not living on the edge then you are just taking up too much space. MJ works well on desktop. "My computer" of Desktop shows 2 MJ drives: one is E: and another is ( Vista only F drive. "My Computer" of TC has 2 MJ drives D: and (vista only E: ) drive. I checked with another guy on the forum who uses MJ with TC. working perfectly for him. He has in his TC 2 MJ drives (D and ( E The E: drive he has is just E: not (Vista only E as I have. He thinks I should format the E: drive and plug the MJ. It will either load sw properly or it may not work. It is risky that is what he said. 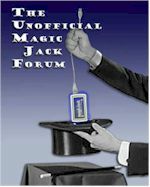 How do your MagicJack drives look like on your TC ? Do you have 2 MJ drives like D: and ( vista only E as I have or both just D: and E: drives. Just curious. What prompted you to format E drive ? If I do not format E drive what is the solution? Will the MJ folks fix the problem I have. Will the tech folks at MJ talk to me if I tell them I am using MJ on TC? Will they support it? Our discussion is helpful to me. They support MJ on XP or VIsta. DO NOT FORMAT the "removable drive" unless they tell you to. I accidentally formatted the entire MJ because I was not paying attention to what I was doing. When I tried to restore it by using the upgrade process it created the two drive system (mine is on XP so I dont get a Vista only drive) One is called "MagicJack" and the other is called "removable cd drive" or something similar. They are either D: and E: or E: and F: depending on which computer I am on. BUT right now the "removable drive" is not capable of being written to and the techs dont seem to be able to help because each one always wants me to click on the upgrade URL and that ALWAYS disconnects me from them and when I go back its a different tech who doesnt know what I have just been through so I try again, and again it disconnects. Its just a circle that I cannot get out of. I repeat, do not format anything!!!! The win software we use on TC is XPe and not XP. Will the MJ tech support XPe? I will not format the drive as per your suggestion. How do the MJ folks restore MJ software on my system and make MJ work on my TC? Do you advise me to go to chat session with MJ tech floks. I know it is not a pleasant experience. You will be going in circles till you get a right person with tech knowledge. Thanks JimisBell for all the help you have given me late last night. I got into chat with MJ folks this evening. Now MJ is running on my TC. It took easily 4-5 hours before the problem is solved. I will give sequence of steps how it was done for your benefit and others on board. When I started this eve. MJ on TC stuck with error 401 Msg says to restart MJ using Menu - Advanced users- Restart. I tried a few times . It did not work. Got into chat. The technician moved me to another computer ( a desktop) where MJ always works with a Ready to Call. Clicking on MJ Upgrade icon on my screen, Mj stopped working with the same error 401 msg I got on TC. We struggled for some time. Now I have TC and desktop with same error 401. A higher level technician ( Kenney) took over - wanted me to change lots of setting in the Norton firewalls. It became too complicated for both of us to communicate. We gave up on that. Finally he suggested that I should FORMAT both MJ drives on the desktop. I had E: drive and F: ( vista only drive). There is no option to format E drive. So I formatted F drive. He gave me a link to upgrade MJ sw ( which can handle both XP and Vista). After upgrading, and replugging MJ I got Ready to Call. Now Desktop problem which was created during chat is now fixed . I plugged MJ on TC which gave me the same 401 error msg. He suggested I should FORMAT the E drive ( vista only) and Run MJ upgrade sw. I did . I got Ready to call on TC. I made in/out calls. It worked. Two crucial steps: 1 Format Vista only drive , upgrade MJ sw ( XP/Vista) . The upgrade link looks like this I am not 100% sure. My suggestio to you is: Reformat your vista only drive and upgrade with MJ sw and see your problem go away. I am glad the problem we had is not due to any limitation with XPe. During these chats MJ folks would have done something ( change in settings) in their end also. I dont have a "vista only" drive because I dont run Vista, I run XP. But after three hours today with second level help they decided to send me a NEW MJ and I will return this one to them. The only bad part is I lost my 100 name contacts list. But in a week I will have a new one. I am glad you got a solution to your problem. I also never had a vista comp but somehow ( might be I started with MJ long time ago) I had ( vista only drive) on my desk top. I never noticed on my TC till another guy from forum pointed out i have vista only drive which is the cause of my problems. I could only format that drive under the guidance of MJ folks. Good to know that our MJ - TC problems are not due any limitations of XPe. I was afraid if that were the case, we have either to upgrade our TC with large chunk of F and R memory and update with full fledged Win XP sw or throw the TC out of windows LOL It takes lot more effort and skills to upgrade TC to run full fledged windows. I do not intend to use my TC for application other than MJ. If someone has a little time to help me that would be great. I cant get MJ working. It didnt auto-install and I finally was able to get the update off the site to get the client up and running but any phone that is plugged in doesnt work at all. No dial tone, no talking. I did some searching and it looks like I need to move a file in the system32 folder on the C drive but I cant get into the C drive. It's a HP 5710. I'm having the same issue...after dealing with 2nd level MJ techs for over an hour I admitted having a TC which I was then told they're not recommended so nothing could be done...the only reason I bought my TC on eBay was for this so any help would be greatly appreciated! Most TC's do not have USB Audio support by default, including the 5710. Without it, you can only use thesoftphone as the jack is non-functional. You need to install the USB Audio Drivers HERE and don't forget to commit the changes or you'll have to do it again after a restart. This should fix your issues. Report back and let us know. When you say "I can't get into the C drive" what do you mean? What is happening when you try and open the C drive? That's exactly what it needed! Thanks!! !